This large Timber Garage is 3.6 x 7.8m in size, and it has been installed within our customer’s extensive grounds in Offham, East Sussex to use for a multitude of purposes, not least for their gardener to use to keep their tools and equipment safe. 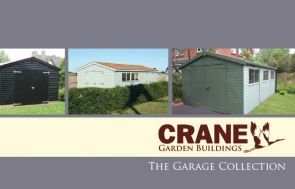 For the customer to get the most out of their new garage as possible, they have chosen to have two partitions put in, giving three separate areas to utilise. There is one large section of 3.6 x 4.8m, and then two smaller sections with their own external doors, comprising of a 2.4 x 3.0m section and a 1.2 x 3.0m section. To keep the large building out of site from the gardens surrounding the house, they asked if we could lower the roof height, which we did, restricting the height to 2.5m. Cedar shingle tiles have been used on the roof, and the building has been painted in the colour, Lichen, which is a dark green colour from our Valtti paint range to help blend the garage in with the tall hedges and grass that surrounds it. Inside, there is an electrical pack, as well as oak faced ply lining on the walls, and insulation in the walls and ceiling. A security pack finishes this timber garage off, ensuring everything inside is kept as safe as possible, and consists of a seven lever lock and heavy duty sliding bolt, stainless steel window bars, and security screws for the door hinges. For more information on our timber garages, you can Contact Us online, call us on 01760 444229, or configure your own design by using our Online Garden Building Planner Tool.